Chinese Foreign Minister Wang Yi said Wednesday in the Uruguayan capital of Montevideo that China is willing to negotiate step by step free trade agreements with Uruguay and other countries in South America. Wang voiced his opinion on free trade between China and Uruguay when meeting the press together with his Uruguayan counterpart Rodolfo Nin Novoa. Free trade between countries is in line with globalization, which helps preserve a multilateral trading system and promote economic growth for all parties, Wang said. 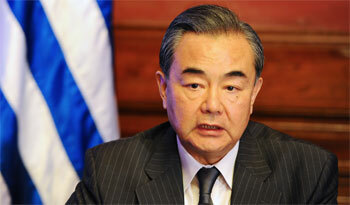 The top diplomat said China’s market is massive, home to 1.4 billion people, and is currently unleashing its potential. At the same time, China, as a promoter of multilateral trade, continues to abide by its strategy of opening up to the world. Wang said China’s trade approach features win-win cooperation and the country expects to share its development opportunities with other countries through free-trade networks. Free trade agreements will pave the way for Uruguay and other Latin American countries to enter the Chinese market, something China welcomes and believes is in the long-term interests of all parties involved, Wang said.